“Searching”: You Can’t Find Someone You Don’t Know « Midlife Crisis Crossover! Short version for the unfamiliar: Star Trek‘s John Cho is David Kim, an average Silicon Valley citizen who’s worked and lived through computers like much of America today. His job is fine, his teenage daughter Margot (Michelle La) is fine, and life feels fine despite a past major setback. One day Margot stops answering her phone and all her accounts, which in some lives could signify someone taking a break from busyness. It doesn’t take long for David to realize she’s missing. Soon he’s got the assistance of a police detective (Will & Grace‘s Debra Messing) who digs and comforts where she can, but he’s willing to bet the best place to find the answers is right there in front of him: in computers. Hence the film’s risky gimmick: all 100 minutes are shot, recorded, typed, texted, chatted, pointed-and-clicked, and acted through screens — old PCs, new laptops, phones, YouTube, and lots of webcams — from the opening wallpaper to the final text. It’s a direct descendant of the Blair Witch “found-footage” film fad of the 2000s, but the action isn’t limited to handheld camcorders and director Aneesh Chaganty isn’t interested in sketchy ambiguity. Sometimes you’re literally just watching David drilling through file folders, opening browser tabs, making spreadsheets, copying-and-pasting, Googling, surfing, and learning about concepts new to him but old-hat to millennials. It would be as tedious as watching someone else play a video game if a young lady’s life weren’t at stake. Hey, look, it’s that one actor! : The cast are mostly unknowns to me in this indie drama that Sony wisely picked up at the Sundance Film Festival. I did spot Sean O’Bryan (from Christopher McQuarrie’s late, lost Persons Unknown) in one scene as a talk-radio jerk, and after the fact vaguely recognized voice actress Melissa Disney (Curare from Batman Beyond) as one of the parents David interviews while vetting Margot’s Facebook friends. You might or might not recognize Sara Sohn (Sense8) as part of the family. Beyond the three leads and the long list of persons of interest, the other actor with the most screen time is Joseph Lee as David’s rascally brother and Margot’s uncle, whose helpfulness is limited but whose rapport with Cho is among the film’s many strengths. Parental love can be a fierce energy, and woe betide any stragglers standing in its path. The internet makes it easier than ever for teens to live a life outside their parents’ line of sight, even if they don’t change all their settings to Private. The meaning of “Friend” varies wildly according to context. Too often nowadays it’s skin-deep. Sometimes grief obscures things from plain sight more thoroughly than even the tackiest Instagram filter. It’s not that easy to learn everything about anyone online, but it’s amazing how far you can get without Deep Web hacker cred, with just dogged persistence and maybe a little desperate funding thrown at one paywalled service. In the film’s truest comparison of social media audiences, once Margot’s story becomes public, the most tasteless, thoughtless, unsympathetic, selfishly inhumane reactions are, of course, via Twitter. Nitpicking? The film might be a little less cinematic if David didn’t keep his webcam on all the time, even when he’s not chatting with anyone, so that his own face is often onscreen next to his active windows. I’ve never used FaceTime and have no idea if maybe that’s a feature rather than narcissism, but it seemed an odd behavior to me. After the film my son and I argued whether or not the typing speeds were realistic. He appreciated that David’s texts took longer to compose than Margot’s. I wondered how she could string together entire sentences in literally two seconds or less. I could accept that some reaction times may have been shortened simply for the sake of sustaining a compelling narrative, but he insists her near-instant responses are in line with real-world phone users. I struggle to buy this because I have sausages for fingers and dream of being able to text at the speed of Margot…and without typos, at that. By and large Searching plays within its self-imposed boundaries, veering only a little when bits of Torin Borrowdale’s score pop in to highlight the tension in key scenes, rather than limiting the film to source music only. Not that there’s anything wrong with the score — its intrusion from outside the screens just feels like a Hollywood concession. 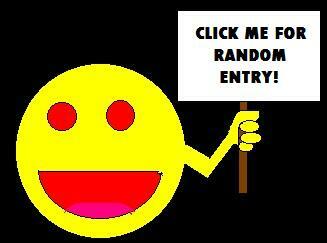 So what’s to like? Searching lures viewers in gradually with a prologue that walks the audience through the Kim family history as seen through computers. If you’ve been Of The Internet long enough, indicators of various periods abound, both funny and nostalgic (screeching 56K modems!). On another level it works as an homage to the prologue of Pixar’s Up, and soon the Kim family and their emotional turmoil are at least as real to us as anyone else who comments on our blogs or Likes our pithy jokes. Having set up the storytelling mechanism and the emotional investment, Chaganty and co-writer Sev Ohanian proceed with a meticulously crafted tale of suspense, a rare modern example of a mystery film that plays fair by seeding clues all throughout. If you keep your eyes on the panoply of windows and browsers as they parade past and pile on top of each other, scan images and captions as quickly as possible, it’s not entirely possible that you’ll catch correlations before the characters do. On an unfairly reductive level, the plot within the framework is no more innovative than the average cop drama, but that’s not the point. What’s revelatory is the story told daringly through actions of keyboard and mouse, expressing emotions through those seemingly ordinary interaction between human and machine. We feel what they feel through what they type, retype, or don’t type, in the hesitation of a click, in the vehemence of an all-caps tirade or a multi-response fusillade, their very hearts revealed in what they delete versus what they save, and in how and where they save it. In this sense the machines are another acting tool in themselves, as telltale as facial expressions or gestures. 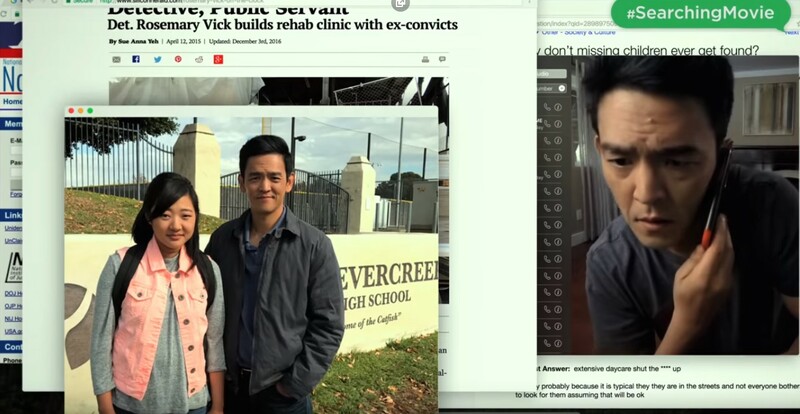 Anchoring the center is a righteous performance from John Cho, trying to save the day with sites and apps in hopes of reconnecting with his daughter, which can’t happen till he faces the disconnections that hundreds of hours of FaceTime failed to show him. As the fearful father on a mission, it’s through him that we realize some of our own worst weaknesses, including the part where machines have the magical powers to communicate and reveal, but can’t show their user what they need to know if they don’t search for it. How about those end credits? No, there’s no scene after the Searching end credits, though their lack of name-checking the various world-famous websites used throughout the film would seem to imply none of them were sponsors, which is cool. A few job titles also confirm some footage (probably in the final act) was filmed with drone cameras, which is definitely different but totally within the rules.